The Viking Age in Britain began about 1,200 years ago in the 9th Century AD and lasted for just over 200 years. About the year 800, bands of fierce raiders began to attack our coasts. They were the Vikings (also called the Danes although they didn't just come from Denmark. See below). The Vikings came across the North Sea, just as the Anglo-Saxons had done 400 years earlier. In time, like the Anglo-Saxons, the Vikings made their home here. They drove the Saxons out of part of the country and took it for themselves. King Alfred, Saxon king of Wessex, fought them in a great battle, but he could not drive them right away and had to let them have part of the country, called Danelaw. When did they invade Britain? Where did the Vikings settle in Britain? What religion did the Vikings follow? What were Viking houses like? What were Viking clothes like? King Harold hadn’t had an easy time of it as King of England! He had been crowned on 6 January 1066 following the death of King Edward the Confessor. Edward died without an heir to the throne but on his death-bed instructed that Harold should succeed him. But Edward was half-Norman and William of Normandy was his nephew which is why William believed he was the rightful king and decided to invade (his invasion is known as the Norman Conquest). The battle which became known as the Battle of Hastings wasn’t the first battle in which Harold was forced to defend his crown; on the 25 September 1066 he’d fought off his own brother Tostig and the Norwegian King Harold Hadrada at the Battle of Stamford Bridge in Yorkshire. It meant that Harold had already lost men in defeating them. He then had to rush south, gathering reinforcements on the way, to defend his throne yet again! Although Harold’s men were tired, he chose to fight William immediately. The Normans got to Hastings by boat, sailing about 700 ships across the English Channel. The famous Battle of Hastings took place on 14 October 1066 and lasted all day long. The battle took place on a steep hill with the Anglo-Saxons at the top and the Normans attacking from down below. The Anglo-Saxons were totally outnumbered. William’s army totalled 15,000 men: soldiers, archers and knights on horseback. Harold had only 5,000 men. Some were soldiers and archers, but others were just farmers called in to help. 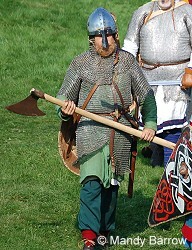 Harold’s men were all on foot, armed with slings, spears and battle axes. The Anglo-Saxons put up a strong defence. They created a shield wall – they stood in a long line, putting their shields in front of them. The shields all overlapped each other to provide the best kind of protection from all the Normans' flying arrows! Initially this was a winning strategy. During the battle the Normans believed that William had been killed. In order to prove that he was alive William pushed back his helmet and reportedly said to his men: "Look, I am here, and with the grace of God I will win the day!" Later in the battle, the Normans pretended to retreat. It was a wise move. Some Anglo-Saxons left the hill to follow them and the shield wall was broken through; the Normans then turned around and attacked. Once the Normans had broken through Harold's ranks they overcame his men easily. Most of the English army were killed where they stood and King Harold was killed by the Norman soldiers and died on the battlefield. King Harold was either killed by an arrow in the eye or by a sword thrust. Once they had lost their King, many of the English left standing ran away. After William became King of England, French became the language of the king’s court. This blended with Anglo-Saxon English and over many centuries became the English language we use today. The famous Bayeux Tapestry, an embroidered linen cloth which depicts the story of the Battle, shows us information about weapons and architecture of the time, as well as the events of 14 October 1066. The Tapestry is 50cm wide and an amazing 70m long! It was embroidered by English women but made for the Normans to celebrate their victory, so it might not be completely truthful in the way it shows what happened.